A recent study shows that hibiscus tea can be just as effective at treating high blood pressure as common hypertension medications. High blood pressure can lead to an increased risk of heart attacks and strokes. Heart disease is actually the leading cause of death, yet improving your heart health is not always a difficult process. By making changes to your lifestyle, you can begin increasing your overall health. For millions of people, a good place to start is with their blood pressure. You do not need to turn to medications or prescriptions in order to combat high blood pressure. Using natural remedies, you can receive the same benefits as taking a hypertension drug without any potential for side effects. One such remedy is drinking hibiscus tea. 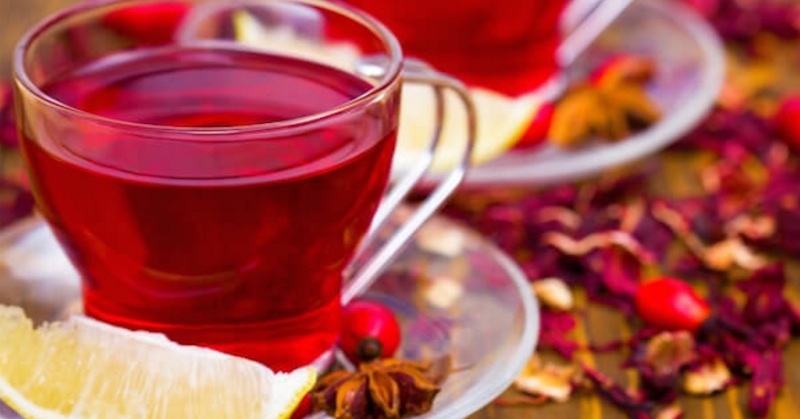 Hibiscus tea has a lemon flavor with a red color and unlike prescription medications there is no risk of side effects. The hibiscus plant is grown throughout most of the United States—making it an affordable plant. In fact, you can even grow your own hibiscus; though, it is also readily available at most stores. If you take a look at popular herbal tea blends, you will find that they contain hibiscus, so you should not have any trouble finding the tea. Several medical studies have concluded that hibiscus tea can be used to treat high blood pressure. According to the latest research, drinking three cups of hibiscus tea every day can help lower blood pressure. In one study, a group of 65 healthy men and women with slightly elevated blood pressure were examined. Their blood pressure levels were measured at the start of the study and then after thirty days. The participants that consumed hibiscus tea every day experienced a drop of 7 points in the blood pressure reading. The health benefits of hibiscus tea may include protection against cancer – stomach cancer, in particular. In a Taiwanese laboratory study, extract from Hibiscus sabdariffa was found to be toxic to cancer cells, and especially effective in killing human gastric carcinoma cells. The study researchers attributed hibiscus’s potential ability as a cancer preventative to its high levels of polyphenols, which are powerful antioxidants. The results of these studies are nothing new, but they do provide scientific backing to a practice that has been in use for centuries. In parts of Africa and Asia, hibiscus has been used in traditional medicine for treating high blood pressure. Researchers in Iran performed another study that provided additional backing to the benefits of hibiscus. A group of 54 adults with hypertension were given tea for 12 days. Participants either received hibiscus tea or black tea and were required to drink it every day. When the 12 days were over, the average blood pressure of the group drinking black tea decreased slightly. The group drinking hibiscus tea saw an average drop of 10 percent in blood pressure levels. This was not the last of the research. Many other studies have been performed and have come to similar conclusions. After looking at all the evidence, it becomes obvious that hibiscus tea is a great place to start if you are trying to lower your blood pressure. To make your own hibiscus tea, steep about 1 teaspoon of the dried hibiscus flower in one cup of boiling water. If you want to make a stronger tea, you can include up to 5 teaspoons of hibiscus. You can make a larger batch, adding one cup of water per serving and an increased amount of the herb. Try drinking one or two cups of the tea every day, to begin improving your heart health. Volunteers in these studies have experienced drops in blood pressure ranging between 7 and 12 percent. Eliminating foods that are acidic and harmful will help make this improvement so much easier.